Wow, it has been a while since my last blog post! I’ve finished up my work as a team manager, been in vacation with Dutch friends visiting me in Israel and preparing my departure from Israel and moving back to The Netherlands. Talking about flying. No matter if my flight is long or short, I always feel drained afterwards. Tired, dehydrated, headaches and often an inflated belly. How to prevent this? How can I make sure I arrive in Holland revitalized and full of energy for the reunion with my family and friends? It’s important to realize that the airplane cabin is really not a healthy environment (see also www.webmd.com/a-to-z-guides/features/keeping-healthy-while-flying). In the cabin the air is pressurized to 7000 ft. It’s the same effect as sitting on top of a mountain. There’s less oxygen in the air, which makes the body work harder to get the required oxygen into the bloodstream. Breathing becomes more laboured. Lower blood oxygen levels cause fatigue, dizziness and headaches. On top of this, the humidity in the cabin is very low, generally below 25%. Therefore, relaxed and efficient breathing is recommended. 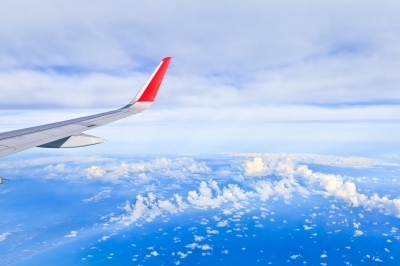 A risk during flying is developing deep vein thrombosis (DVT). 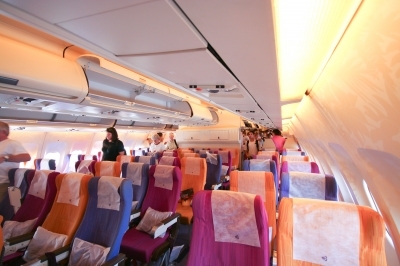 The risk of developing DVT is increased by periods of immobility because the sitting and leg room is very cramped. Developing DVT is also influenced by dehydration and low cabin pressure (see www.webmd.com/a-to-z-guides/features/keeping-healthy-while-flying). Try to keep your circulation flowing and your legs moving and the muscles contracting as much as possible! Try walking up and down the cabin, standing up in your seat, stretching your feet and contracting your calf muscles. Hydration before and during the flight is an important measure to prevent dizziness and headaches and it prevents the mucous membranes from drying out, which happens because of the lack of humidity in the cabin. When the membranes are dried out, it makes it harder for your system to flush out germs (see www.caring.com/articles/10-preboarding-secrets-to-staying-healthy-when-you-fly). Make sure to drink enough before you get through the security check. Bring an empty water bottle that you can fill after the check so you can board the plane well hydrated. Try to stay away from coffee and alcohol on the flight to prevent getting more dehydrated. Also, keep your skin hydrated for protection against dehydration. You can bring a spray bottle to directly hydrate the skin, or use essential oils. Some options for hydration are lemon, rose and sweet orange (www.webmd.com/a-to-z-guides/features/keeping-healthy-while-flying). Add some drops to plain water. In the cabin environment digestion of food is harder. It’s therefore advised to eat little. Often, the airplane food is not your best option. Therefore, its best is to eat a meal before boarding the plane. Pass on cold foods and carbonated beverages. Choose warm food and tea or water (not ice cold) instead. You can decide to bring some snacks like flax seed crackers, rice cakes, bananas, apples, granola mix or in case of a long flight even bring protein powder to mix with water. To prevent catching airborne pathogens on the flight, make sure to keep your immune system strong. Because of the dry air in the cabin, moisture is being sucked out of the tissues in your mouth and nose, which compromises the body’s natural defence systems (www.caring.com/articles/10-preboarding-secrets-to-staying-healthy-when-you-fly). To prevent congestion, bring a bottle of nasal saline spray with you on the flight to moisture the membranes inside your nose to prevent the tissues from drying out. Also bring hand sanitizer with at least 50% alcohol, disinfecting wipes a shawl that can be used as a blanket and a travelling pillow. Wear glasses instead of contact lenses to prevent drying out and making your eyes vulnerable to microbial invaders (www.cntraveler.com/stories/2014-10-28/travel-tips-how-to-stay-healthy-while-traveling). Before flying, you can boost your immune system by eating a diet rich of fruits and vegetables to benefit fully from the vitamins, minerals and antioxidants. Often, you’ll have to deal with enormous changes in temperature which can be tough on your body. Make sure to pack layers; a sweater, scarf and socks. If your neck, shoulders and feet are warm, you should be okay. Heat is very important to maintain a healthy immunity on your flight. A jet lag is caused by disruption to the body’s internal clock when you head across time zones. Avoid mental and physical fatigue by trying to stick as closely as possible to your usual routine. Try to eat at similar times during the day and even if you’re really tired upon arrival, it’s recommended to stay awake for as long as possible and go to sleep at a normal time in the evening. Also, try to stay outside during daylight. The natural light will help your body clock to adjust (www.medicalnewstoday.com/articles/237345.php). Relaxing and unwinding is an important part of staying healthy on your flight. Try some breathing or relaxation exercises, listen to your favourite music or bring a good book! Image courtesy of Khunaspix, PinkBlue and Nitinut at FreeDigitalPhotos.net.